The Spode® Christmas Tree china pattern is the most collectible of all Christmas ware. This new line of trim and hand-painted blown glass ornaments will add a rich holiday layer to the well-dressed home. Blown glass ornament company Landmark Creations has been chosen by The Porcelain and Fine China Companies to develop a line of Christmas Trim and ornaments for the most beloved of holiday china patterns - Spode Christmas Tree®. The line will not only feature some of the original blown glass ornaments “Ornaments on the Tree,” but new styles commemorating the classic Spode Blue Room china pattern as well. The traditional Spode Christmas Tree pattern has been replicated in a line of exquisite velvet trim pieces. Now the beloved Christmas Tree pattern can extend from the dining room table to the living room, bedrooms and entry hall to create a total coordinated holiday look. The Trim Collection includes a Tree Skirt, Stocking, Mantle Cover, Pillow and Door Knob Pillow, each sewn from plush cream velvet and decorated with rich embroidered detailing featuring the Spode Christmas Tree. Landmark Creations Web site will allow collectors to preorder these items for delivery in Fall 2006. Spode Christmas Tree SkirtThe spode Chrismtas Tree skirt is an exquisite confection of cream velvet and embroidery. 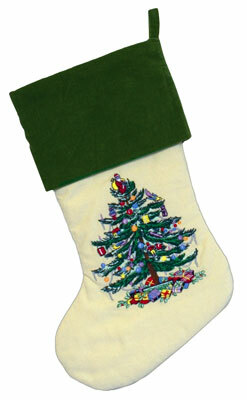 Spode Christmas Tree StockingPlush cream velvet and sage green trim accent the classic Spode Christmas Tree pattern on the stocking. The Spode Christmas Tree Door HangerThe Spode Chrismtas Tree velvet and tasselled door hanger makes the perfect hostess gift.